"Munchausen syndrome by proxy is a form of child abuse in which a parent induces real or apparent symptoms of a disease in a child." 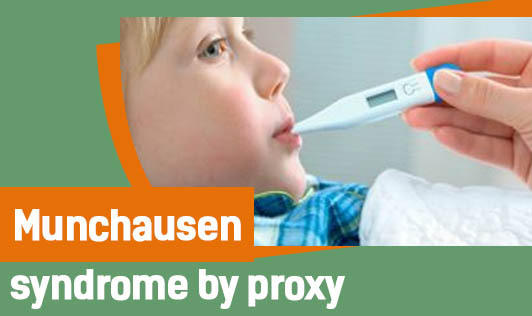 People with Munchausen syndrome by proxy create or exaggerate one's child's symptoms in several ways, or the parent may lie about symptoms, alter diagnostic tests, falsify medical records or induce symptoms such as suffocation, starvation, and cause infection. This occurs because of psychological problems in the adult and is usually an attention seeking behaviour and the syndrome can be life threatening to the child involved. In most cases, MSP goes undetected and doctors generally begin to suspect child abuse when a child experiences frequent illnesses and injuries. The exact cause of this condition is unknown but doctors believe that both psychological and biological factors are involved. This condition is very difficult to treat and often requires long-term therapy and support. A child needs to be removed from the direct care from the parent. Please seek psychiatric help immediately if you have urges to harm your child!